View More In Hair Combs. Featuring both fine & wide toothed sides, our sandalwood beard comb provides men everywhere with the flexibility & dependability they require from a beard comb. Our wide tooth side is perfect for working out knots & prepping your beard for your favorite beard oil or beard balm. After applying your beard oil or beard balm, flip to the fine tooth side to refine & tighten up your beard for the perfect look. Dead skin cells can wreak havoc on an otherwise healthy beard, trapping residue, unwanted oils & dead skin cells in it. This can lead to unwanted flaking, dryness & brittleness. Combing your beard regularly & removing dead skins will help improve the appearance of your beard & promote healthier beard growth. Combing your beard regularly also ensures any trapped residue, unwanted oils or dead skins don't build up on your skin & prevent unwanted acne or irritation. Unlike plastic combs, which can cause static when combing through your beard, our sandalwood beard comb is naturally anti-static meaning your beard is easier to tame, shape & style. Regular combing of your beard will help to reduce the likelihood of knots & will soften your beard, making it easier to style when applying beard oils or balms. Included with our comb is a stylish & protective carrying pouch to shield your comb from the elements. Its sleek design means it fits in virtually any pocket, so whether you're at the office, the gym or travelling on the road, your beard comb won't be exposed to unwanted dirt, dust or grime. - Coming your beard when it's damp allows knots to be worked out more easily. DURABLE & PORTABLE - Protect your comb from the elements. Designed to fit in your pocket to allow for on-the-go grooming. 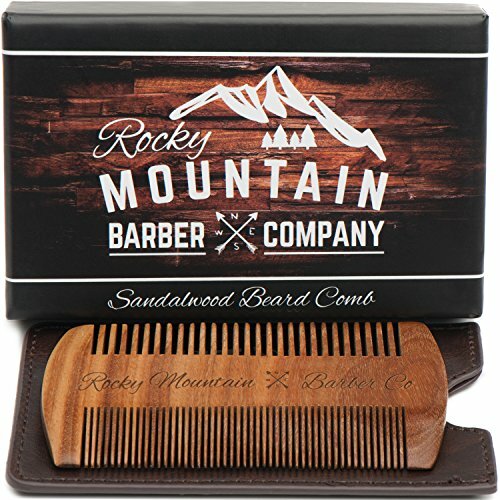 If you have any questions about this product by Rocky Mountain Barber Company, contact us by completing and submitting the form below. If you are looking for a specif part number, please include it with your message. Onedor Natural Handmade Green Sandalwood Wide Tooth & Fine Tooth Hair Combs Set, Natural Sandal wood scent for Beautiful Hairs. None-Tangled Hair & Anti-Static by nature.